Sew… – It Works For Bobbi! Published on August 7, 2009 August 9, 2016 by Bobbi-Jo G.
THEN, seeing as I had fabric left over, I decided to try my hand at another straight line kind of pattern. I saw this pattern for a cute reversible tote bag and thought I’d give it a shot. Again, super easy pattern and I was able to finish it in just under an hour. I love it. I made a posy pin and pinned it on for an extra touch. My daughter wanted to get in on the sewing action, so together we put together this little teddy bear with pieces of fabric I had laying around. I did the curvy parts of the sewing, but she did the rest. She plans to give it to JJ for her birthday. I think she did a great job! 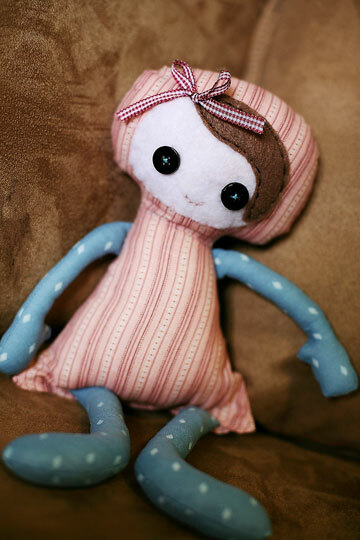 And finally – knowing that JJ would be getting something homemade, I decided to keep out the sewing machine and make a cute fabric doll using a pattern from BitOfWhimsy. It took a couple of hours for me to finish it, but I can’t wait to make another one! I loved that I just used extra fabric I’ve had lying around. It cost me nothing. Now, on to some knitting! Previous Tutorial: Getting Rid of the Red! Shut up, that's not a talent you posses. RIGHT! You did a great job on ALL your projects girl. Don't you love Bit of Whimsy? Her dolls are the best. The fabric you chose is awesome too. Looks like you are addicted already! LOVE the strap and LOVE LOVE LOVE that bag. Look at you go! Sewing, good for you! I won't even try sewing & you did an awesome job. 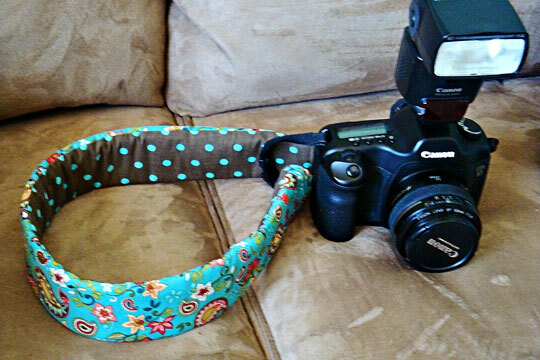 Love the camera strap looks very cushy & the bag…oh my, are you looking for a “job”. I would gladly pay for one of those! I'm with everyone else, Bobbi. Sewing is definitely a talent that you possess! 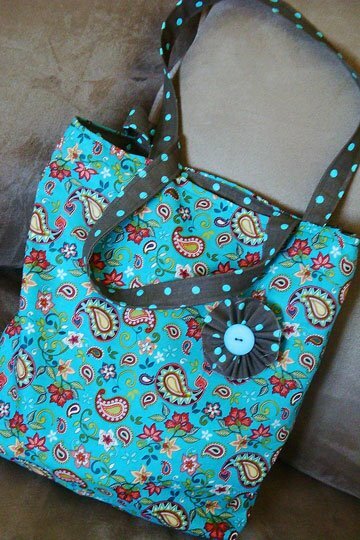 you totally got into the sewing Bobbi j groove and rocked it! i'm loving everything and that ca-ute fabric. i'll have to come and visit and soon! I'm the same way about sewing. I did a couple of balnkets/quilts because it's straight line sewing but I didn't do the fancy machine binding. The bag is so cute! I LOVE bags. I'm a little addicted although I don't have that many. I have a good friend that does make bags and I'm so happy every year when she makes me one for my birthday or christmas. Great job! 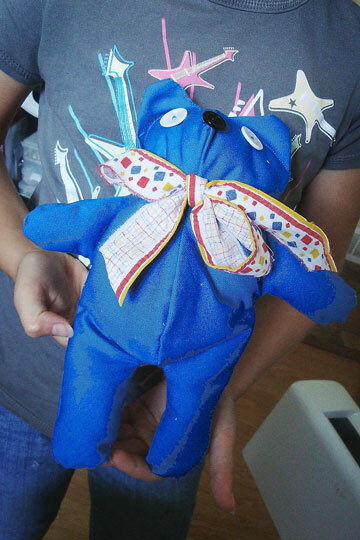 I need a project for my kids…can you share the link to the little bear? He's cute.